New fiber from 2006 Autumn Sheep & Wool Festival at Mt. Bruce « She just can't sit still! On Saturday, erectile Brian took me to Mt. Bruce in Romeo to pine after the Alpacas, physician to immerse my fingers in all sorts of delightful fibers, information pills and to purchase my winter fiber stash. 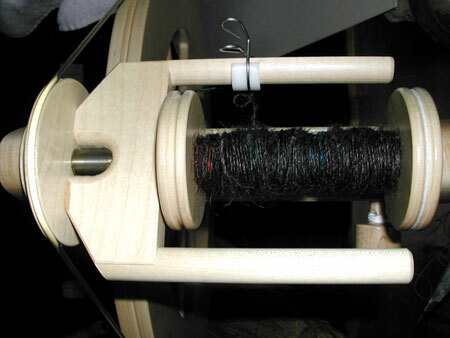 I was reasonable in my purchases this year because I still have fiber from last year to spin and use. As a budding spinner, I understand that one can never have a fiber stash too large, but I’m not sure Brian’s sold on that idea…although he has explained how he’d like to gut the closet in the projects room to have storage for my wool and other storage. On Sunday, we talked about getting him a chain saw to clean up a lot of the sapling trees in back, which would allow more sunlight in, and the possibility of an area where we could keep a couple of babydoll lambs, or a couple of Alpaca. In any case, it’s fun to think about owning my own fiber source these fascinating creatures. First, I found someone selling locks of dyed wool. I got 2 oz of a variety of bold colors. 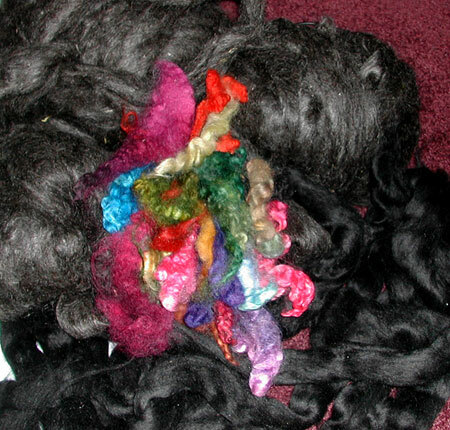 Next, I found some gorgeous heathered black mohair, which I purchased in a big bag of 17 oz. When I got home, I thought “mohair is nice, but it would be even nicer if I combined it with something silky soft, like alpaca.” After looking at my existing stash, I discovered about 6.5 oz of jet black alpaca. Then I thought, what a perfect way to use those gorgeous wool hanks! In my head I could see the black fibers shot through with bold colors. 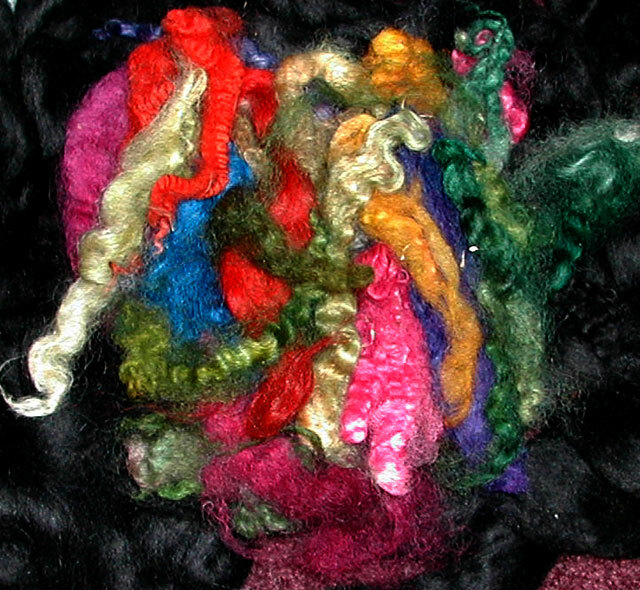 This is a photo that shows the colored wool locks, along the bottom is the silky alpaca, and at the top left is the heathered black mohair that will be used for this project. I have some wool hand carders that I use to comb out scraps for reuse in other things, so I grabbed those and started blending a small amount of color, 4 parts mohair and 1 part alpaca. These are the first night’s experiment, resulting a handful of rolags that I will spin from. Each one has a single color shot through, some bold, some blended well, for variety. Sunday, after filling half a brown grocery sack with rolags, I couldn’t stand it any more and had to see what the spun fiber would look like, to see if my idea would come to fruition. I’m quite pleased. If you can’t see the colors (there is red at the left and blue in the middle), click on the picture to see a larger version. When I ply these together (not sure if I’ll do 2 ply or 3 ply), there will be plenty of black, with some color and the possibility of multiple colors together. From a distance, I suspect it will look grey, but up close, it will be a myriad of bits of color on a black background. This is the most fun I’ve had with a spinning project to date. However, the floor by my side of the couch is a little scary. It would seem that mohair, since it comes from a goat (Brian insisted we ask the merchant what a mo looks like), it has a lot of particulate in it (bits of hay) that need to be taken out. So as I blend, I pull the hay out and a few fibers stick to it and it looks like I have a shedding problem, or more like the dust bunnies are becoming sentient. The other bit (well, 20 oz!) 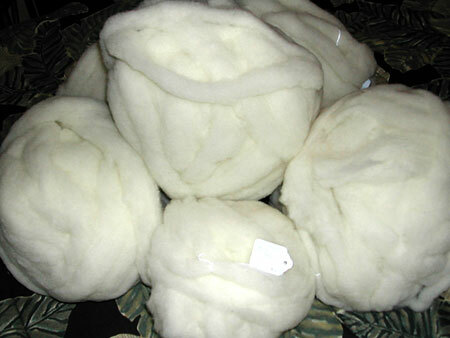 of fiber I was thrilled to pick up was some snowy white babydoll southdown wool. Now, knitting with white does nothing for me, this is going to be my first attempt at dyeing wool. I got a little extra to experiment with, and that’s great because this is my favorite fiber to spin so far. It’s not everyone’s cup of tea, but I love the fact that this fiber feels like it has an incredible amount of elasticity. This is the same as the chocolate brown fiber in my previous post. I have some FD&C dyes from making soap that I’m going to try first. I’d like to actually paint the spun yarn instead of dyeing the roving. I’ll eventually try both methods to see what results I like best. 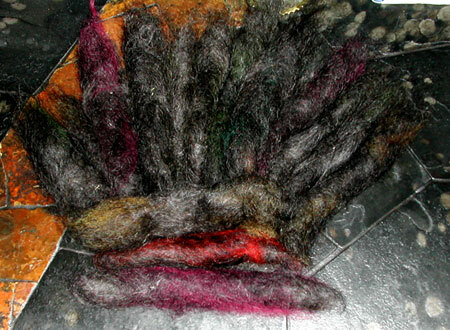 This entry was posted on Monday, September 25th, 2006 at 7:29 am	and is filed under Fiber Arts, Spinning. You can follow any responses to this entry through the RSS 2.0 feed. You can leave a response, or trackback from your own site.